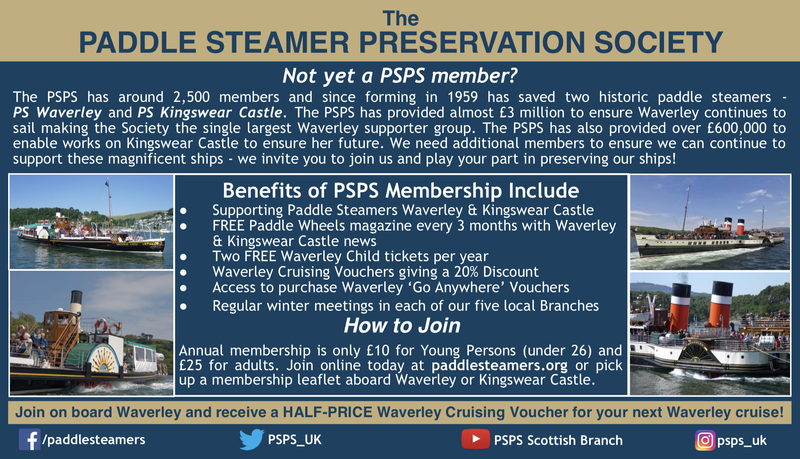 At the PSPS Scottish Branch meeting on Friday 16th November the Waverley Grand Draw 2018 took place. The draw was made by Ken Darroch, who sold the majority of tickets aboard Waverley and John Newth who was the guest speaker for the evening. The proceeds from the Draw will go direct to Waverley - £5,757. The Scottish Branch would like to acknowledge Ken Darroch for his hard work and commitment to selling Draw Tickets around the decks on Waverley. The Branch would also like to thank all those who supported the Draw by purchasing tickets. Title image - Waverley captured as she heads from Helensburgh while on charter to the PSPS Scottish Branch in July 2018. Image provided by PSPS member David Shirres.